I am a bit of a candy addict. I have the dentist bills to show for it. I love caramels and they are great to give as a gift too. I know many people love caramels, but many complain that it sticks to their teeth. This recipe is for soft melt in your mouth caramels. When waiting for the mixture to reach hardball stage, line pan with aluminum foil and rub butter on the foil. Once the liquid mixture reaches hardball stage remove from heat. Add vanilla and then the cube butter gradually. The butter will want to separate just keep stirring until mixed well. Pour into the butter foil lined pan. Let cool in the fridge for at least 4 hours to overnight. 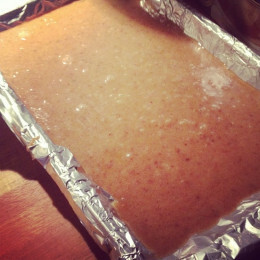 Remove the caramel sheet from the foil. 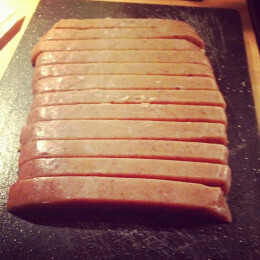 I recommend using a cutting board and large knife and make large strips of candy and the cut of 1 inch pieces. 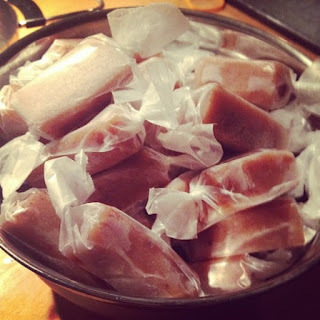 Using wax paper cut into squares and wrap each caramel individually and twist the ends. Serve at your next party or give as gift.